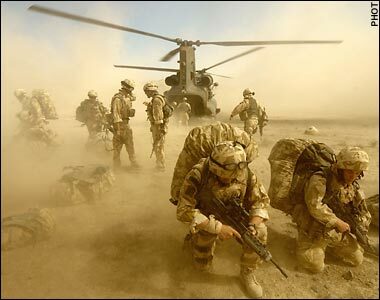 As US and British troops prepare to attack the town of Marjah in Afghanistan’s Helmand Province, military commanders and the media are openly comparing the operation to the November 2004 siege of Fallujah, one of the bloodiest war crimes of the Iraq war. The operation in central Helmand province, long an area of intense resistance to the US-led occupation, will constitute the largest military offensive since Washington invaded the country in October 2001. At least 15,000 troops are expected to lay siege to the Helmand river valley town, which has 80,000 inhabitants and is said by the US military to be a stronghold of the Taliban. A total of 125,000 people live in the district around Marjah, which is an agricultural center 350 miles west of Kabul. The population has been swelled by Afghans fleeing villages occupied by US Marines last summer, following President Barack Obama’s order shortly after he took office to send 21,000 more troops into Afghanistan. US Marines, frustrated and enraged over casualties suffered at the hands of an unseen enemy who is able to attack and then blend back into the local population, will be unleashed against the town in a violent military assault, with predictable results. “We’re going to go in big,” said Nicholson, commander of the 2nd Marine Expeditionary Brigade. “I’m not looking for a fair fight,” he added. In a highly unusual move, the US command has publicly announced plans for the offensive. “It’s a little unconventional to do it this way, but it gives everybody a chance to think through what they’re going to do before suddenly in the dark of night they’re hit with an offensive,” said General Stanley McChrystal, the senior US commander in Afghanistan. The stated intention of revealing the target of the upcoming offensive is to allow civilians to flee before the Marines move in. It also provides a preemptive alibi for the US offensive by painting those who fail to heed the warning as die-hard Taliban who deserve to be killed. What is the record of urban assaults of “this sort”? The Marine assault on Fallujah in November 2004 reduced most of the city of 300,000 people to rubble, as warplanes dropped thousands of tons of explosives and helicopter gunships and battle tanks fired missiles into buildings and strafed the area with cannon fire. The US military command claimed to have killed 2,000 “insurgents,” but the real death toll remains unknown. Civilians who remained in the town were subjected to the same bombardment. Some were shot to death during the door-to-door raids that followed, and others were killed while fleeing. Wounded fighters were summarily executed, and medical facilities were targeted for military attack. All those in the city were denied food, water and electricity for more than 10 days. The operation was a vicious exercise in collective punishment against the population of Fallujah for the killing there of four Blackwater mercenaries and the city’s protracted resistance to foreign occupation. It embodied the criminality of the entire war and was characterized by multiple and gross violations of the laws of war. If American military commanders are to be believed, a similar operation is being prepared in Afghanistan, and for similar reasons. The town of Marjah is to be turned into a killing field. As in Fallujah, vengeance plays a role. US military forces have seen a steady escalation in casualties over the past year, while the CIA suffered a humiliating attack at the end of December that left seven of its operatives dead on the Afghan border. In Afghanistan, as in Iraq, the US military command sees value in making an example of a population center known as a center of resistance to occupation, sending a message to the entire country that such resistance is futile and will be met with slaughter and destruction. This bloodletting is officially justified in the name of a never-ending struggle against terrorism. Behind the propaganda, the driving force of the war in Afghanistan, like the war in Iraq, is the attempt by America’s ruling elite to counter the crisis of US capitalism through the use of force and the seizure of strategic positions in the Persian Gulf and Central Asia, both centers of vast energy reserves. A year ago, when Barack Obama entered the White House, there existed hope among broad layers of the American people that his inauguration would turn such words as Fallujah, Abu Ghraib, Guantánamo, Blackwater, torture and rendition into the lexicon of a dark and shameful, but closed, chapter in US history. The preparation of the Marjah offensive only underscores that, far from being ended, the crimes of the Bush administration are continuing and escalating under the Democratic president. Today there are more US troops deployed abroad in colonial-style wars and occupations than under Bush, and the killing has spread from Iraq and Afghanistan to Pakistan and Yemen. The Obama administration is seeking $322 billion for the two ongoing wars and occupations, a figure that will doubtless be swelled by further demands for “supplemental” funding. The supposed candidate of “hope” and “change” has emerged ever more clearly as the hand-picked agent of sections of the political establishment and military-intelligence complex that wanted to effect certain tactical changes in policy, while continuing to employ militarism abroad and wage a relentless assault on the working class at home. American working people cannot accept a new round of war crimes carried out in their name. The demand for the immediate and unconditional withdrawal of all US and other foreign troops from Afghanistan must be joined with a political offensive against the Obama administration and the financial oligarchy that it defends.